Although the calendar year is winding down, for me it is also the beginning of the year 5777, the Jewish New Year. This means I get a second crack at New Year’s resolutions, a head start on planning for 2017 and also, thanks to several weeks of holidays, a renewed spiritual energy. And it’s a good thing, too, because I have a feeling 2017 is going to be filled with change. But I’m getting a little ahead of myself, so let me explain. I am in the process of developing three different major professional projects. Two of them are solely my own, but one of them involves a potential partner. That is perhaps the project that is the most daunting and also the one that is currently the most fun. I have never had a business partner before. Many years ago I owned a small franchise business and although I was part of a supportive network of owners, I was pretty much on my own. I enjoyed all of the success, but also shouldered all of the burdens. This time around, I’m planning to partner with a friend, something most people run from. But I am confident we have a very specific division of responsibilities and a very clear vision for what we want to create. And while I have some anxiety over sharing control, I believe for now that it’s a worthwhile trade off. I want to offer some tips for partnering because whether it’s with a friend or someone who is just a business associate, there are some things that are universal. Before deciding to partner, figure out if it’s really necessary. That sounds obvious, but many people get carried away with the idea of going into business with their BFF and before you know it, things are out of control. Conversely, some people lack the confidence to go it alone and default to having a partner. So ask yourself, “What do I bring to the table, and what is missing?” If the missing skills and talents are things you can learn on your own, by all means try it. If there are specific skills you lack that cannot be readily acquired, consider a partner. Also consider your financial resources. Do you need to invest with someone, or can you take the risk yourself? 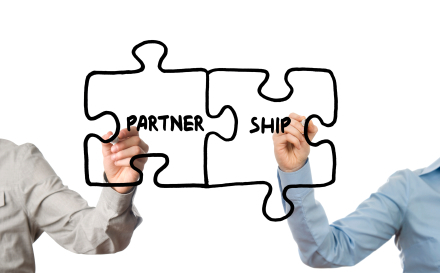 Once you decide you require a partner, work on developing your business plan together. TAKE. YOUR. TIME. Do not rush this part of the process. It is critical to the success of the partnership that you learn how to communicate and get to know each other’s quirks, strengths and weaknesses. Even if you are friends, this is a new context for your relationship and it will take time to develop. Figure out how you will divide your responsibilities and financial resources. It is critical that you both have a clear sense of who is doing what. Again, obvious maybe, but it’s amazing how quickly things can unravel in all the excitement and stress of setting up a new business. This is a good time to consider consulting an attorney who can help you define the parameters of the partnership and it’s dissolution. Kind of like a business pre-nup! Be patient! Setting up a business takes time. Patience is definitely not one of my virtues, but I’ve been working at it. It helps to make realistic goals and expectations. Having a partner is beneficial for me because we keep each other in check and commiserate when things don’t go as planned. HAVE FUN! I know it’s business but really, why take the risk if you don’t believe in what you’re doing and it isn’t fun. Try to stay focused on your goals and find pleasure in the little things. Finally getting a call back from a potential landlord after several attempts to connect, hearing potential clients tell you they can’t wait for your business to get going, finding out you can get a discount on some of your necessary materials. Things like these add fuel to your dream. Keep going, it’s worth it!